Stu and Lorna met at the University of Sheffield Ski Club in the early 2000s, and have spent the last decade or so enjoying the Peak District and planning adventures further afield! Chalet Chef – Lorna has previously spent time as a chalet host in Chamonix and is currently busy planning menus for the coming season. Chalet Manager – Stu is a runner and part-time academic, and previously spent many happy days teaching and racing at Sheffield Ski Village. 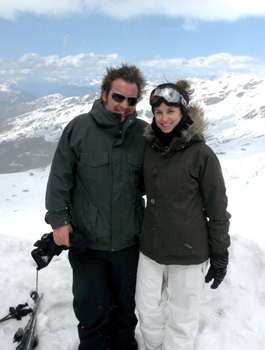 Stu and Lorna are very excited to fulfil a long-held dream of working together in the mountains and can’t wait to get to Chalet Chardon Bleu and meet their first guests! Josh and Amber are from the sunny cider country of Taunton, Somerset. After meeting nearly three years ago whilst both at college they struck upon a mutual love of music, festivals and the beautiful white peaks of the Alps. They have spent every waking hour since working towards the goal of doing a ski season and now their dream has become a reality and they are both extremely excited to join the team at Chalet Chardon Bleu. Emma has over 11 years experience managing chalets in St Martin De Belleville. Emma combines experience, with quality and a passion for service. Gra met Nicky on a snowboarding trip in the 3 Valleys and so started the dream of one day running a successful ski business. Gra is from Kent. Having spent 3 years as a global vagabond travelling the world Gra founded a successful recruitment company in the UK. After numerous visits to the French Alps Gra always dreamt of one day moving closer to the white stuff! Nicky is from Essex but insists that shouldn’t be held against her! After a successful career as a figure skater Nicky’s now spends her time passing on her knowledge to the next generation of British champions.